Philosophical Disquisitions: The Democratic Trilemma: Is Democracy Possible? 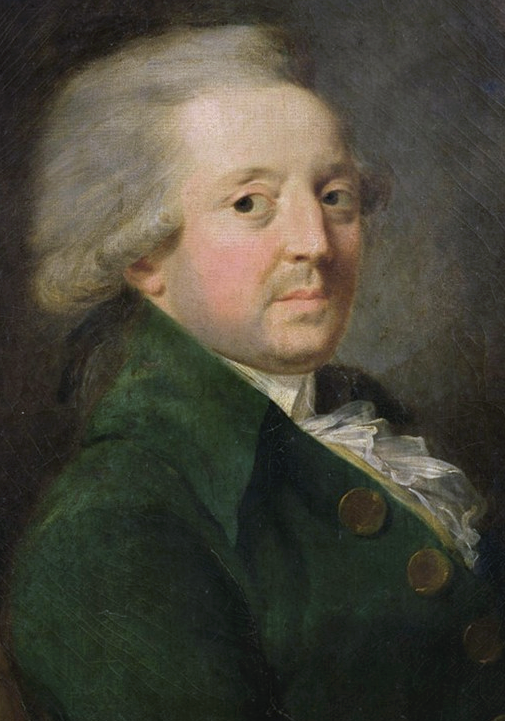 You may have heard of the Marquis de Condorcet (Nicolas de Condorcet). He was an 18th century French philosopher, mathematician and social theorist. He was a champion of the Enlightenment, and a leading participant in the French revolution. He is probably most famous today for three things. First, his jury theorem which showed how, under certain conditions, majority voting can get us closer to the truth. Second, his voting method which proposed that winners of elections be determined by pairing each candidate against every other candidate and figuring out who won each of those contests. And third his voting paradox which revealed how majority preferences could be inconsistent if there were more than two candidates or options to be voted upon. You may not have heard of Christian List — though you really should have. He is a contemporary philosopher, operating out of the London School of Economics (as of 2015 anyway). He is a champion of a highly formal and axiomatised approached to philosophical theory. And he has expanded and refined many of Condorcet’s original ideas, as well as coming up with quite a few of his own. I like his work a lot, even if some of it is over my head. One of my favourite of his articles is “The Logical Space of Democracy”, in which he attempts to trace out the space of possible democratic decision procedures. One key part of this article is List’s articulation of the democratic trilemma, which is a more general version of the Condorcet Theorem, applying to all collective decision-making procedures (it is also similar to, but different from, the famous Arrow Impossibility Theorem). The trilemma proposes that there are three things we would intuitively like from any democratic decision-making procedure, but that it is only possible to satisfy two of them at any one time. In this post, I want to explain what the trilemma is and why it arises. I’ll use this as a springboard for explaining List’s logical space of democracies in a future post. Collective Decision Problem: Any situation in which two or more individuals must form intentional attitudes towards certain propositions and then use those attitudes to determine subsequent (collective) actions. This is quite a general characterisation of collective decision problems, probably more general than you first realise. As List notes, the intentional attitudes at the heart of the decision problem can be representational or motivational in nature. In other words, they can be attitudes towards statements of fact like “lax regulation led to the financial crisis of ’08”; or they can be attitudes towards statements of desire, intention or principle like “we ought to introduce stricter regulations of the financial sector”. I say this is more general than you might first appreciate because collective decision-making — particularly in the political context — is often understood solely in terms of the ranking or ordering of preferences (“I prefer candidate A to candidate B” etc. ), and not in terms of things like beliefs about the world. Another point worth noting here is how assumptions about rational choice may influence our thinking about collective decision-making. At the individual level, it is commonly assumed that decisions are rational if they evince a harmony between sets of representational and motivational attitudes. For example, my decision to go to the shop to get some milk is rational if (a) I believe the store stocks milk and (b) I desire milk. The key question is whether harmony between sets of representational and motivational attitudes is possible at the collective level. Collective Decision Procedures: Any procedure which takes as its input a group of individuals’ intentional attitudes toward a set of propositions and which then adopts some aggregation function to issue a collective output (i.e. the group’s attitude toward the relevant propositions). The basic schematic is illustrated in the diagram below. One of the more interesting parts of List’s article is his illustration that the space of possible collective decision procedures — i.e. ways of going from the individual attitudes to the collective attitude — is vast. Much larger than any human can really comprehend. For example, if you have a simple collective decision problem, in which three people must state their preferences for options A and B, there are 256 possible collective decision procedures. I won’t go through the full illustration of the point here, but to give you a sense of what List is talking about, imagine an even simpler decision problem in which two people have to vote on options A and B. There are four possible combinations of votes (as each voter has two options). And there are several possible ways to go from those combinations to a collective decision (well 24 to be precise). For example, you could adopt a constant A procedure, in which the collective attitude is always A, irrespective of the individual attitudes. Or you could have a constant B procedure, in which the collective attitude is always B, irrespective of the individual attitudes. We would typically exclude such possibilities because they seem undesirable or counterintuitive, but they do lie within the space of logically possible aggregation functions. Likewise, there are dictatorial decision procedures (always go with voter 1, or always go with voter 2) and inverse dictatorial decision procedures (always do the opposite of voter 1, or the opposite of voter 2). You might find this slightly silly because, at the end of the day, there are still only two possible collective outputs (A or B). But it is important to realise that there are many logically possible ways to go from the individual attitudes to the collective one. This illustrates some of the problems that arise when constructing collective decision procedures. And, remember, this is just a really simple example involving two voters and two options. The logical space gets unimaginably large if we go to decision problems involving, say, ten voters and two options (List has the calculation in his paper, it is 21024). How can we constrain our exploration of the logical space of decision procedures? List recommends the axiomatic method. This involves starting with a set of axioms that specify what we would look for in our preferred type of procedure. In this particular instance, we are interested in decision procedures that fit with our conception of democracy. Democracy calls for individual input and control over collective decision-making. This means we can instantly rule out all procedures that would exclude, ignore or prioritise particular individual attitudes. 1. Robustness to Pluralism: The decision procedure accepts any possible combination of individual attitudes about propositions which are on the “agenda” for any given decision problem. This is, in effect, an inclusiveness condition. It forces the aggregation procedure to include all combinations of views on a given set of propositions. If there are two voters, and they are being asked to consider three separate propositions, each of which can be either affirmed or denied, then all combinations of affirmation and denial should play a role in influencing the collective output. This fits with our intuitive conception of democracy because democracy is supposed to be about giving some power to all points of view. 2. Basic Majoritarianism: A necessary condition for the collective acceptance of any proposition is its majority acceptance. This is arguably the most straightforward requirement. For most people, democracy is synonymous with majority-based decision-making. The one thing to note about this condition is that it states that majority acceptance is a necessary condition for collective acceptance, not a sufficient condition. This means that basic majoritarianism is not the same thing as simple majoritarianism (where all you need is >50% approval). Basic majoritarianism could also include unanimous or supermajoritarian decision-making procedures. 3. Collective Rationality: The collective output should be a consistent and complete set of attitudes on the propositions on the agenda. This might be the trickiest condition to understand. In essence, it tries to carry over the requirements of individual rationality to the group level. So imagine you had to make a decision on two propositions (A and B), each of which could be affirmed or denied. Your individual decision would be complete and consistent if it covered both propositions and if the combination of attitudes towards those propositions did not entail some sort of contradiction. The collective rationality requirement is simply saying that the collective output should do the same. And this is where things get interesting. List argues that it is impossible for any collective decision-making procedure to satisfy all three requirements if the decision-making problem has some complexity to it. Let’s see why this is the case. The Democratic Trilemma: For all but the simplest collective decision making problems (e.g. voting on one proposition), there exists no decision procedure which satisfies the requirements of robustness to pluralism, basic majoritarianism and collective rationality. At most two of these requirements can be met at once. There is a general proof of this, provided in an appendix to List’s paper. I’ll just run a relatively simple informal demonstration of the trilemma. We can reasonably imagine that the members of a cabinet could have different attitudes toward each of these propositions. 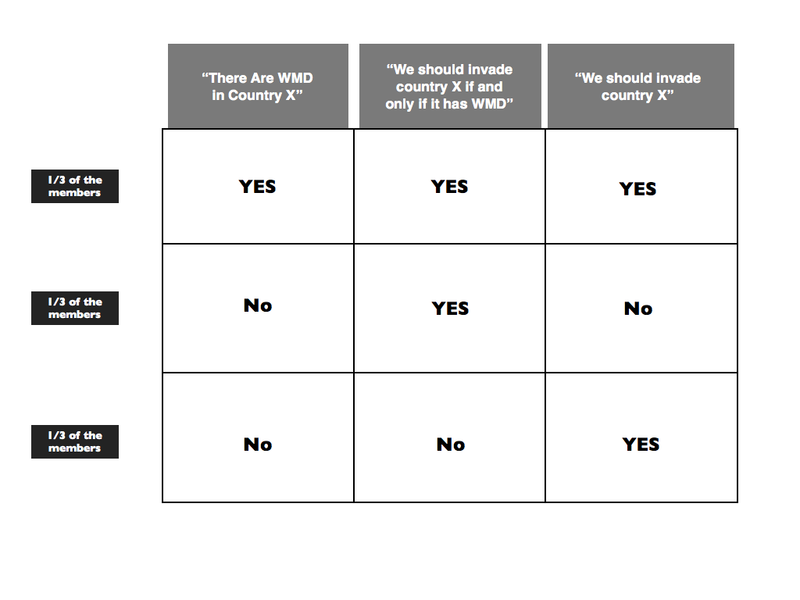 Some people might accept all three; some people might think that country X does not have weapons of mass destruction, but that this shouldn’t prevent an invasion on other grounds; and so on. Nevertheless, they must make some collective decision based on all three propositions. To demonstrate how the trilemma arises we’ll use proof by contradiction. 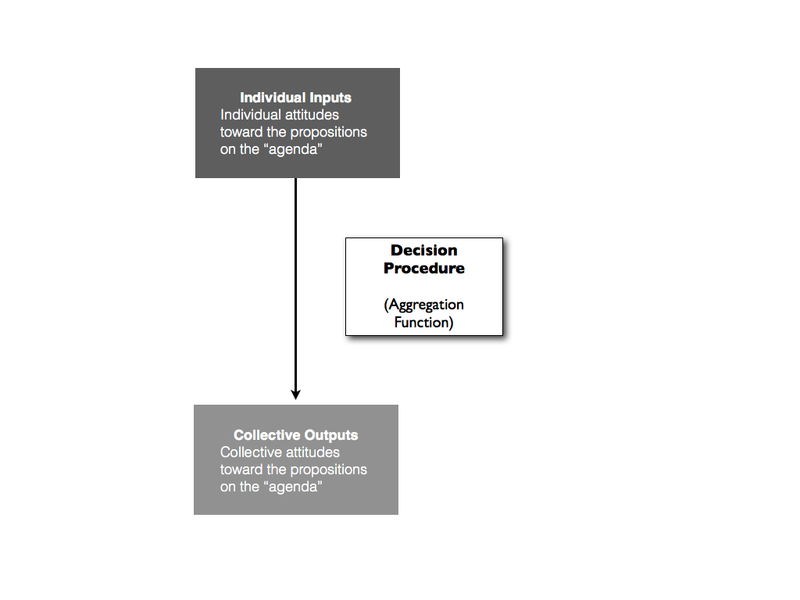 In other words, we will start with the assumption that the collective decision-making procedure satisfies the three requirements and show how that assumption leads to a contradiction. This we can do by imagining that the individual attitudes toward the propositions are depicted by the table below. So, one third of the government agrees with all three propositions; one third disagrees with proposition 1 and proposition 3 but agrees with proposition 2; and one third agrees with proposition 3 but not with propositions 1 and 2. This is a perfectly sensible collection of individual attitudes. The first group represent all those who think that the possession of weapons of mass destruction is the only reason that could justify an invasion and that such weapons are indeed in possession of country X. The second group represents all those who think that the possession of weapons of mass destruction is the only reason that could justify an invasion and that country X does not have such weapons. And the third group represents all those who think that country X does not have such weapons, but that this is irrelevant to the question of invasion because there are other justifications for this. According to the requirement of pluralism, our collective decision procedure should be able to factor in all these opinions. And according to basic majoritarianism, the collective attitude toward each proposition should (at a minimum) represent the majority view. The majority reject proposition 1, accept proposition 2, and accept proposition 3. Collective Attitude 2: The only good reason for invading country X would be if country X had weapons of mass destruction. Collective Attitude 3: We should invade country X. This set of attitudes is clearly inconsistent. This demonstrates how the trilemma arises. List gives other examples in his paper, and they all highlight the same phenomenon. To briefly sum up, it is initially plausible to suppose that any democratic decision-making procedure should be able to consider all possible combinations of views; should (at a minimum) accept the majority view; and should conform with the requirements of collective rationality (i.e. be complete and consistent). But List has shown how this is impossible for all but the most simple decision problems. This is what gives rise to the democratic trilemma. You may be curious about the relationship between the democratic trilemma as formulated here and Condorcet’s voting paradox. The answer is that Condorcet’s voting paradox is a special instance of the trilemma, one which is specifically concerned with collective decision-making procedures that involve the ranking of options. List’s trilemma is the more general problem. Accepting the trilemma as a reality has some interesting implications for democratic theory. In particular, it suggests that there is a limited space of possible types of democratic decision-making. I’ll provide a map of that space in the next post.